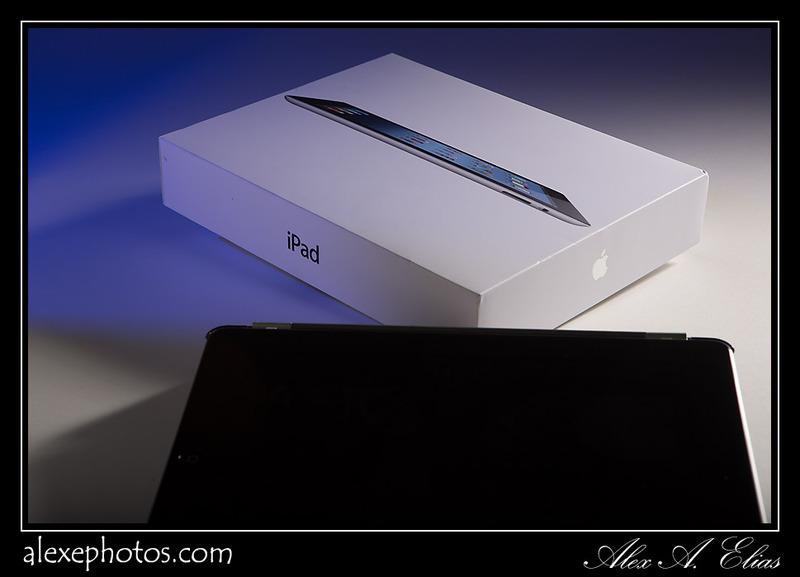 For Christmas 2011 My dear wife got me an iPad that I have been enjoying a lot. 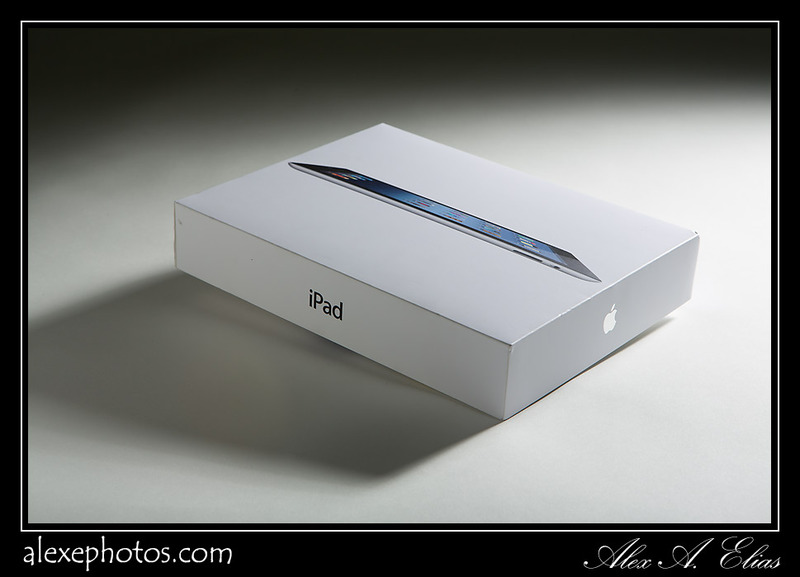 Now that her birthday it’s coming, it is time to get even and I got the new iPad for her. The original lighting setting for this pictures was done with one Travelite 750 set to 1 o clock with a 11″ reflector and a 30Deg grid. I used a flag beneath the reflector to block the light a bit on the white background behind the box. At 7 o clock I position a white bounce card to open up the shadow on the front left side of the box. After a few shots I decided to add a second light to color the background and that was done with a Canon 580 EXII with two cuts of blue gel. All the lights were triggered with a Pocket Wizard Mini TT1 and Flex TT5. The Camera I used is a Canon 5D Mark III with a Canon EF 24-70 f2.8 L. White balance I think it was set at 6000K, iso 100 F14 speed 200th. 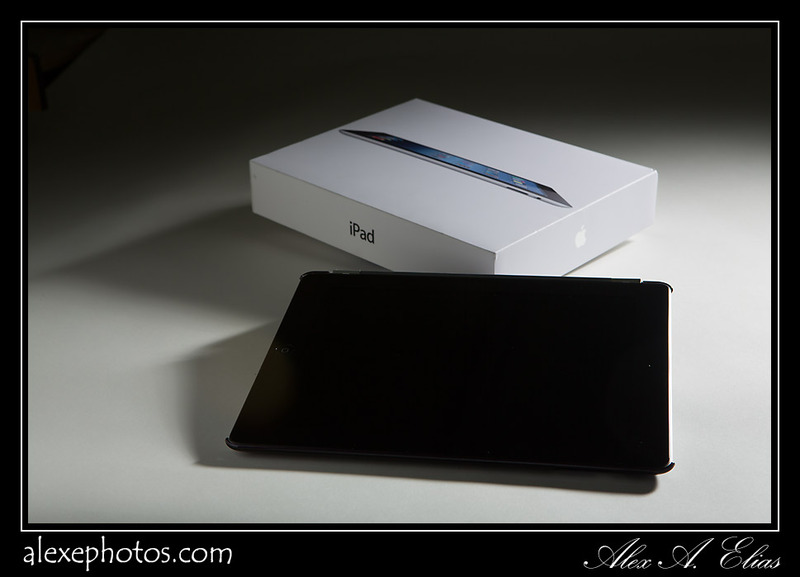 I kind of like the first picture but I wanted to incorporate the actual iPad to the image. Then I decided to be creative and start playing with colors and that is when the Canon 580EXII came in. Also I turned on the iPad so it would look cool with a picture on the screen. When saw that third image I did not care for it. The exposure was not nearly enough to record the screen (IT WAS ON FOR THIS PICTURE) and I think the crop did not look right at all, it was like a black square in front of the box. Then I recomposed the image and started trying to light the display with a third light in such way that it would show the image. Needless to say it did not matter what I did or where I positioned the light, the darn display was too dark or I ended up reflecting light into it or got a bunch of glare on a black screen. That is when I did something I don’t do often… Think. The answer pop right into my head. The exposure for everything but the screen was already done with the flash, the camera was steady on a tripod. The flash duration is quite fast, therefore it did not mater the shutter speed being at 200 when nothing is moving. Now are you thinking what I’m thinking? You’re right. 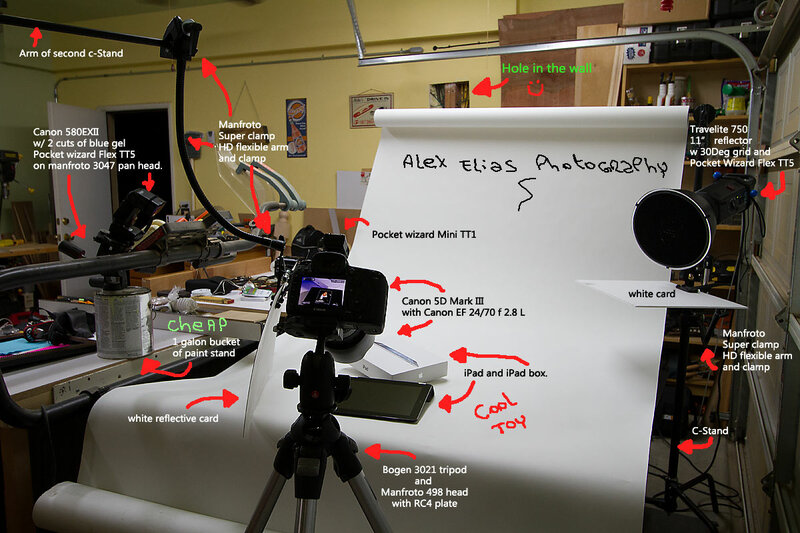 Turn of the ambient light and work on total darkness, take a picture for 30″ and see what happens. Bingo, the box and background are exposed by the flash and the screen it exposed using it’s own light. (I had to play with the exposure time to get it right, it ended up being 5″or 10″) and that is it. 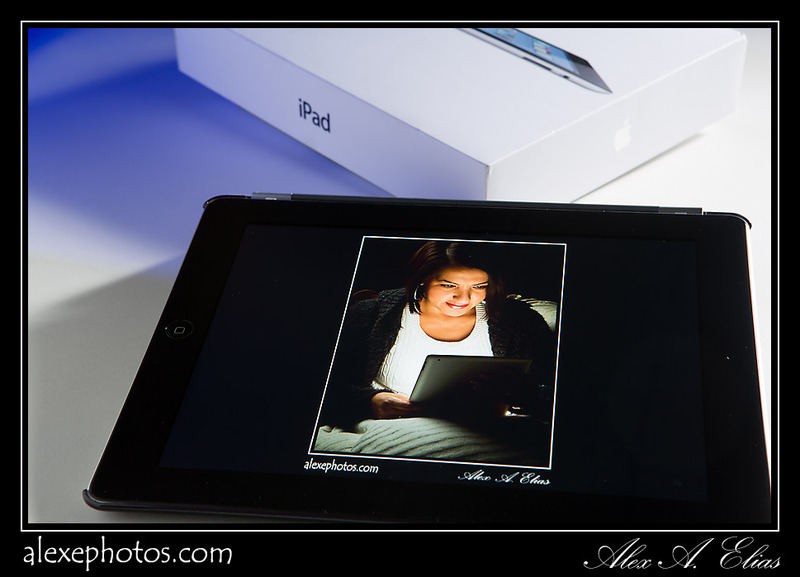 By the way, the picture on the display is my wife reading my iPad. I took that picture a few months ago and I thought it was going to be cool to use that image for this one. If you have any comments or thoughts I would certainly appreciate if you leave some feed back. PS: If you made it all the way to the end here is a bonus picture of the settings.